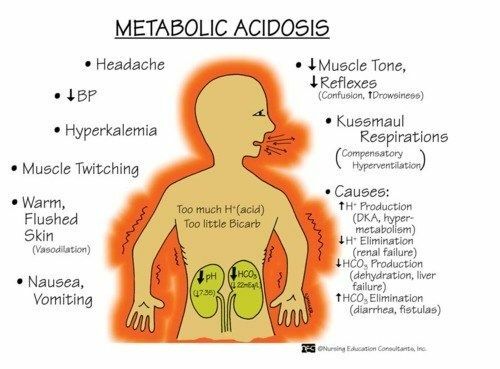 Home » Health » What Is Acidosis ( Metabolic and Respiratory ) ? What Is Acidosis ( Metabolic and Respiratory ) ? Diabetic acidosis. This condition usually occurs in diabetics with insulin levels or uncontrolled ketones. Lactic acidosis. This condition occurs when the content of lactic acid in the body is very high. Lactic acidosis is usually triggered by excessive alcohol consumption, long-term use of long-term salicylic acid, or medical conditions, such as hypoglycemia, heart failure, renal failure, cancer, seizures, sepsis. In addition, lactic acidosis can also occur when the body lacks oxygen supply for a long time or when a person excessively exercises. Hyperchloremic acidosis . This condition occurs when the body is deficient in sodium bicarbonate. This is common when someone has diarrhea or vomiting for long periods of time. Renal tubular acidosis. This condition occurs when the kidneys can not get rid of acid through the urine and actually collect in the blood. Chronic respiratory diseases, such as asthma. Obesity that complicates the process of breathing. Abnormalities in the shape of chest and spine anatomy, such as kyphosis . Abnormalities in the nervous system of the body. Eating alcohol or sedative drugs exceeds the recommended dosage. Use sedative drugs along with alcohol consumption. There are two types of respiratory acidosis, namely acute and chronic respiratory acidosis. Acute respiratory acidosis is an emergency and should be treated quickly so as not to endanger life. Probable chronic respiratory acidosis is not an emergency and is occasionally asymptomatic. This is because the body can adapt to excess acids, for example by producing sodium bicarbonate to balance acid-base. However, keep in mind that this condition can become acute if left untreated. The risk of getting an acidosis can increase when a person has a habit of eating foods high in fat and low in carbohydrates, suffering from kidney failure, dehydration, or drug intoxication. Easily feel tired or sleepy. Breath smells like the smell of fruit (signs of diabetic acidosis). Symptoms such as lethargy, delirium, to coma may occur if the respiratory acidosis condition is not treated promptly. If the patient has chronic respiratory acidosis, the symptoms are not always felt. However, signs such as memory loss, difficulty sleeping, and behavioral changes may occur. Immediately see a doctor if you feel the symptoms of acidosis in order to be treated early. Blood test. Arterial blood gas analysis can be done to determine the levels of oxygen and carbon dioxide in the blood. Another type of blood test is a comprehensive metabolic panel to know how well kidney function is, as well as to measure acid levels (pH), calcium, protein, sugar, and electrolytes. Scan test, through chest X-rays and lung function tests. Urine test. This test is performed to find out whether the excess acid in the body is removed through the urine. Treatment of acidosis will be adjusted according to doctor type and severity. Generally, treatment of acidosis is done in the hospital. In the case of hyprechloremic acidosis, doctors will usually give sodium bicarornate, either in oral or intravenous fluids. In addition, sodium citrate will be given if the patient has kidney failure. For diabetics, insulin will be given in conjunction with intravenous fluids to balance acidic liquids. And for people with lactic acidosis, bicarbonate supplements, antibiotics, intravenous fluids, or oxygen will be given. If the condition has not been severe, the detoxification process can be done, especially for patients who experience drug or alcohol toxicity. In the case of respiratory acidosis, doctors will usually administer diuretic drugs to reduce fluid buildup in the lungs and heart, or use a device called continous positive airway pressure (CPAP) as a respiratory aid for patients with weak lung weakness or COPD. While in patients with chronic respiratory acidosis, doctors will generally give antibiotics, diuretics, corticosteroids or bronchodilators. If the patient's condition is severe enough, a mechanical ventilator will be installed. Keep in mind that acute respiratory acidosis is a fatal condition. Make sure you get to the hospital immediately if you have shortness of breath or have other lung problems. Stop smoking so that lung health is not disturbed. Maintain weight to avoid obesity. Eat enough water to avoid dehydration. Use sedatives or other medicines according to the doctor's advice. Avoid consuming alcoholic beverages, either during treatment or afterwards. Keep your blood sugar well. 0 Response to "What Is Acidosis ( Metabolic and Respiratory ) ?"